Since 1992 Vermont Soap has specialized exclusively in sustainable, strictly natural and USDA certified organic formulations. When natural matters its time to call in the experts. Vermont Soap created the first organic pet shampoo and the first organic gel soap (a true gel and not a liquid). Since then we have gone on to annually manufacture over 175 different certified organic products and to be a part of a hundred other natural and organic products as a bulk ingredient for in house formulators. If you choose to certify the items made by us for you, we will handle the paperwork for a small yearly charge. Talk to one of our customer care specialists today and explore the possibilities. From shea butter to deodorants to bar, liquid and gel soaps; Vermont Soap is the private label soap manufacturer you have been looking for. We offer numerous products for organic personal care including skincare and hygiene, oral care, anti-aging and specialty cleaning, custom and specialty manufacturing and filling. Our job is to help you to make your product a reality. If you are considering expanding your line, outsourcing your in-house production, lowering your liability exposure by using safer formulations, or you have a cool personal care idea; give us a call to learn more about how we can further your projects and help save the planet one body at a time. Custom formulations and modifications to your specifications. FAQ page for more information. 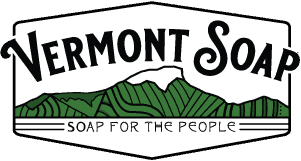 To learn more about what Vermont Soap can do to help you start or expand your line without using toxic chemicals please contact us or call us at 802-388-4302. Open 8am to 5:30pm US Eastern time. Note: Vermont Soap only accepts projects that are strictly safe, nontoxic and natural to be manufactured in our certified organic products processing facility in Middlebury, Vermont, USA.